This Garlic Butter Shrimp is so easy to make and tastes so so good! 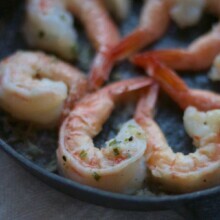 If you love shrimp and garlic, then this is the recipe for you! Makes a great dinner or appetizer. Stir butter, garlic, chives, salt and pepper together to incorporate. Melt in large cast iron skillet over medium heat. Add in shrimp and cook 1-2 minutes a side or until they turn bright pink. Remove from pan immediately to prevent overcooking and serve hot. *any size of shrimp should work just fine!